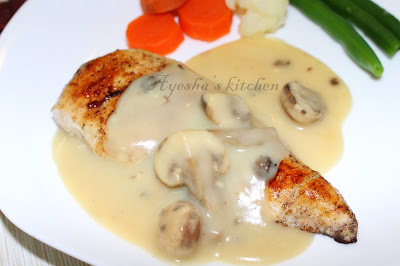 Chicken supreme with cream of mushroom is a french cuisine and the term supreme is used to describe the breast of chicken. Chicken breasts are low in saturated fats and calories if grilled or broiled when compared to red meat. This is one of my favorite grilled chicken recipes. Chicken supreme originates from Russia and can be found in different versions to fit different countries or regional tastes. 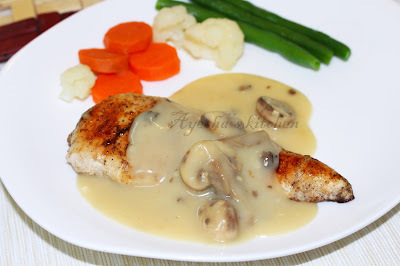 Chicken supreme with creamy mushrooms is one of my favorite dishes which i had from Palma beach hotel, UAQ. I fell in love with this dish when i tasted it for the first time and searched google for the recipe..And i feel very happy that i made it and it turns out really really well.. It is a very easy, quick and healthy recipe.. Hope you all love this chicken breast recipes. Marinate the breast with pepper powder, garlic powder, salt and olive oil. Heat the grill pan / pan and when hot grill the chicken for about 8 minutes or until both sides get cooked in a medium flame. No need of adding oil in the pan. Meanwhile prepare the mushroom sauce. Heat oil in a pan and add the sliced mushrooms and saute it for 2 minutes. Mix the cornflour with the chicken stock and pour it to the pan along with white pepper and garlic juice. Stir continuously until thick and creamy. When done add oregano and fresh cream. Mix well with the sauce. While serving pour the hot cream of mushroom over the grilled chicken placed in a plate and serve along with cooked or grilled vegetables. Have a healthy dinner. Enjoy!! !